Benoit and Eric quickly realized that, for most ecologists, the existing workflow to produce publication-quality maps was to either spend a lot of money by using proprietary software or to spend a lot of time by using free alternatives with a steep learning curve. 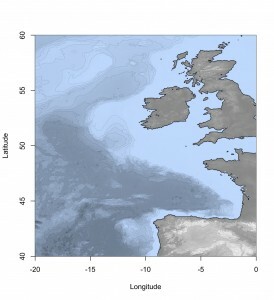 Since more and more ecologists perform their data analyses within R, they thought it might be of interest to a lot of people to be able to easily import bathymetric data from public databases without having to leave the R environment and to plot these data without having to write dozens of lines of code. So gathering their scripts, they translated them into functions and wrote help files. 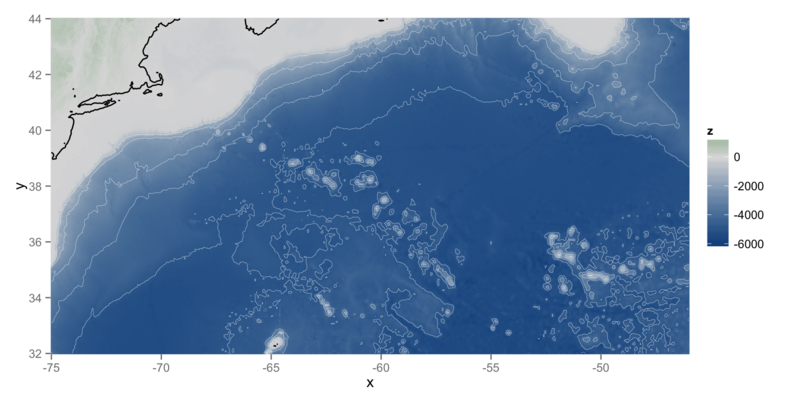 Most of the code is still rough around the edges, but today, marmap users are able to produce great-looking bathymetric maps in minutes with only a few lines of code as compared to 50-80 lines of code without marmap. When they created marmap, the original goal was to make the typical marine ecologist’s life easier. 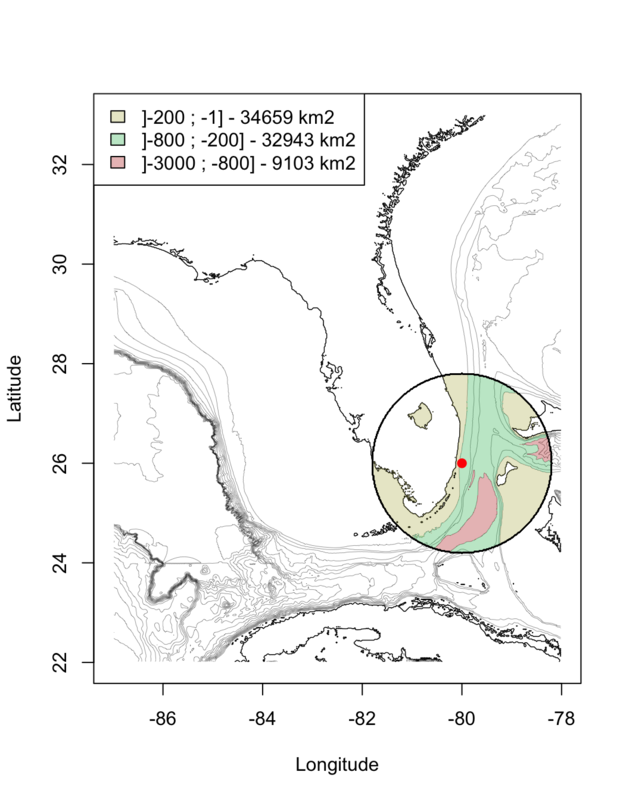 However, these functions do more than just plot bathymetric maps. They can be used to produce elevation maps as well, making marmap a useful package for marine and terrestrial ecologists alike. Indeed, most public databases (e.g. ETOPO1 hosted by NOAA or the gridded bathymetry data hosted by GEBCO) do not differentiate between bathymetric and hypsometric data. # Compute least cost paths between -5m and -300m. # Beware! 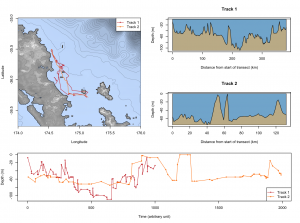 Computation takes time with high resolution bathymetries! 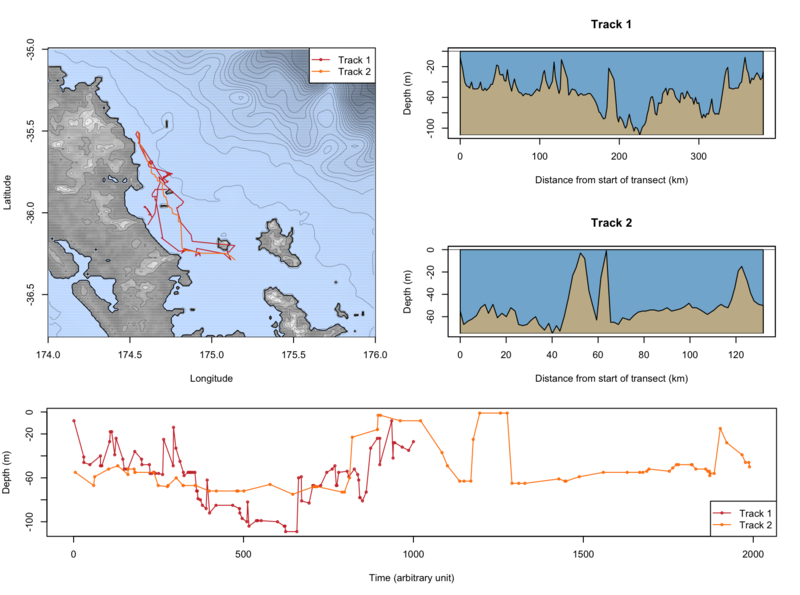 retrieve depth/altitude of arbitrary points, including points gathered by gps tracking/biologgers, etc. Examples of most of these methods are provided as a package vignette called marmap-DataAnalysis.pdf. Two other vignettes describing (i) plotting functionalities (including maps in the antimeridian region and projections) and (ii) data import and export strategies, are available on the marmap cran page or using the vignette() function in R. They have also published a paper introducing the package and its functionalities. Benoit and Eric are still actively working on the development of marmap, based on their own evolving needs and on requests from users. For instance, they are currently working on adding EEZ and plate boundary data. 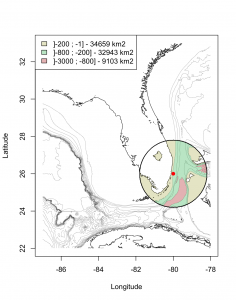 Also, they are welcoming new developers, notably to help implement efficient methods to load and analyze custom bathymetric data that are irregularly spaced (i.e. data that do not fit in a grid). This is one of the most requested features and they do not yet have an easy way of implementing it. Krigging methods seems to be the way to go but their knowledge in the matter is more than limited. So they told me to publicize the call to contribute,provide suggestions for improving marmap, or if you want them to add new functionalities, drop them a line! Thanks Benoit (for writing the majority of this post) and Eric! This entry was posted in community ecology, conservation, evolution, howto, natural history, R, software and tagged coding, landscape genetics, marmap, molecular ecology, R. Bookmark the permalink.